To celebrate the beautiful and thoughtful works that are made across the Indo-Pacific, we’re introducing an “object of the month”. The first of these laurels goes to Anne Jillett for her Salt Pot. 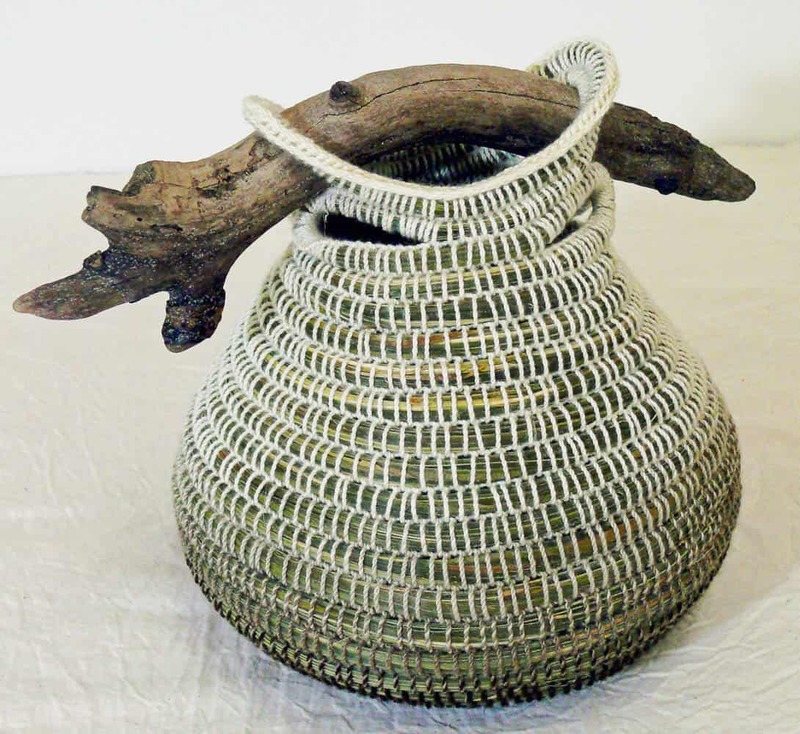 It has a wonderful loopy shape, a distinctive technique and innovative way of combining with wood. Anne lives in Bellenden Ker, a small rural hamlet of cane farms and rainforest in Queensland. You can see more of her work at Ellis Road Fibre Arts. For a long time I had been yearning to learn how to make bilums, when I was fortunate enough to strike up a conversation with Maryanne Tokeme at the iconic Rusty’s Markets in Cairns. Maryanne is a PNG woman from Wapenamanda in the Western Highlands. With the proceeds from her bilum and basket stall, she was contributing to the establishment of a primary health care facility in her village. We struck a deal. She would teach me to make bilums, and I would donate my efforts to her stall for sale. This was the beginning of a journey for both of us. Maryanne taught me the basics of bilum making, her culture and some of the pidgin language. Sitting on a milk crate each week, while she guided my slowly developing skills, we shared stories of our lives. I met many PNG women over the two years I sat with Maryanne. They were intrigued that a white woman could make bilums and would join us each week to yarn and laugh. It was through these connections that I was taught the finer points of bilum making and learned the art of incorporating intricate designs. This experience continues to provide a strong influence on my development as a textile artist.